Breeders should be responsible enough towards the development of the breed quality, which means that they need to breed German Shepherds which this breed have actually been created for… WORKING. This demands that the selected dam and the sire must be physically and mentally sound. Deviation from the standard are considered as faults, and no breeder should breed to produce faulty animals. Selective, scientific and well planned breeding programs should be undertaken in order to filter out the undesirable qualities and pass on the most desirable qualities to the progenitors. Responsible breeders do not breed for money. Responsible breeders take every pain to look for the right kind of homes for their puppies. Responsible breeders make every possible drives to educate the home members to qualify the family which their German Shepherd puppies are going to be kept with. Responsible breeders tend to take immense care of the dam during the pre-delivery and post-delivery periods. Responsible breeders participate in the breed survey. Responsible breeders or mentors should be more than happy in discussing about their stud dogs and lineages with the new owners of his puppies. Good breeder breeds only healthy dogs that are allowed to be bred. Breeders usually put their animals in the trials and earn titles in order to ensure that his animals are allowed to be bred. Responsible breeders usually put their animals to breed test (breed survey), which ensures if the animal has proper physical and mental characteristics, fit for the working ability. The dog should have hip surveyed. The GSD hip must have passable hips certified by an acceptable organization such as the SV (German Shepherd Dog Club of Germany) or OFA (Orthopedic Foundation of American). The elbows should be tested to find if the dog has displastic elbows or other defects. 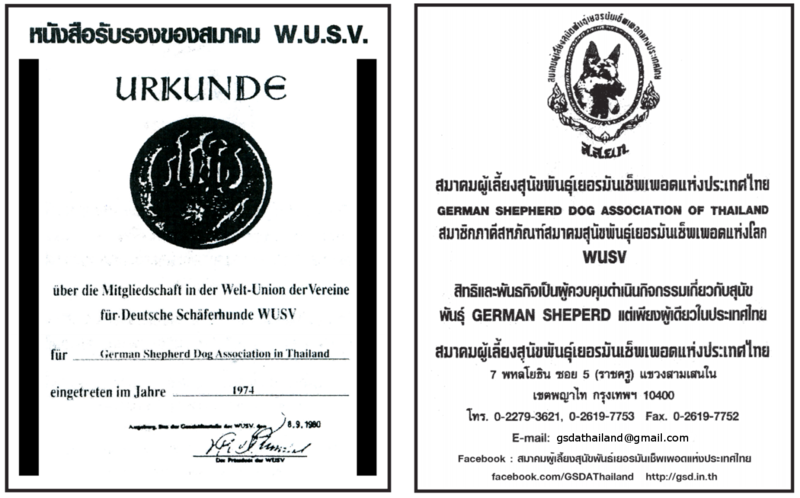 ไม่เพาะพันธุ์ เพียงเพื่อเห็นแก่ " เงิน "
Responsibility of a breeder towards his German Shepherd Dogs is immense. A responsible German Shepherd Dog breeder should always focus on development of the breed while breeding. They never breed GSD without registration papers. The bottom line is that in order to breed German Shepherd Dogs breeders should check if the animals are allowed or fit for breeding. Until that a breeder cannot be considered as responsible.